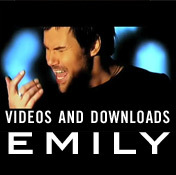 Buy Emily EP on iTunes! Charizma play with Gdansk Symphony Orchestra on June 22nd! Charizma to play the Fjardafestival in Faroe Islands! 22 czerwca Charizma zagra koncert wraz z Gdańską Orkiestrą Symfoniczną! We flew down to Warzaw last Thursday and had a really busy four days. We met the management and went to our hotel pretty early on Thursday. Friday morning we got up at 4 AM (!) since we were doing the biggest TV-morningsshow "Coffee or Tea" at 6 AM. They had us do 5(!) songs playback, which was nice. I did some interview with the hostess of the show too. They had a nice TV-chief too and he made great strawberry shakes. 2 million viewers. After that we did sound check and camera rehearsal for the Eurovision Song Contest show. The studio looked great and it had a nice club feeling to it, with standing spaces for about 500 people. GREAT lighting. Then after some interviews and stuff we rushed off to do another TV-show that was broadcast by satellite. No singing, just sitting in discussing the ESC, talking to some other guests and eating cake. One of Poland's top chefs was in the studio and had created a fantastic cake. I wanted more, since we hadn't been to lunch yet and it was almost 4 PM. 1 million viewers. I don't think they eat properly in Poland. Crazy schedule, and no food planned. After that last TV-thing we went to a great restaurant though, it was all genuine Polish food, and it was really classy and so YUMMY! Loved it. We had lots of fun with our management guys from New Line Music, Przemek, Tomek and Sonia. We went to bed early to get lots of sleep. Saturday was all about the ESC qualifications, we went to the TV-house at about 11 AM, hung around, did cam rehearsals, interviews etc. Off to a quick lunch and then back for the dress rehearsal with audience. It went well. Not a lot of camera direction, but I worked something out with the cameras that I thought looked good. Then it was time for the show. I was not really nervous at all, just excited. I say we performed at about 80% which is quite good in a situation like that. Straight after the performance I did a short interview in Polish. I had worked on those phrases for 2 days and I apparently nailed them cause people thought I was fluent. :-) I got a good ear for languages, but Polish is really quite different. In the green room it became quite clear early on who was gonna win... Almost as it was decided beforehand. We were voted No. 1 by the Eurovision Fan Club of Poland and got a diploma for that. Those guys from OGAE Poland has been so supportive and really nice the whole time. Great people! It was really nice to get achance to meet some of them. There was also a backup jury made up of music and TV-business people that were to step in in case the televoting would fail. They also had us as No. 1. And those are the people who kinda decides what comes on Polish TV and Radio. We didn't win, but it was a great success. Now it's about getting airplay for the song, and promotion. I will be going down there to do more TV in the Spring. There is also a tour booked in August/September. So... all the effort payed off. It was worth it in the end.